Here is your weekly reminder of Psalm 19 — colliding galaxies, Arp 274. 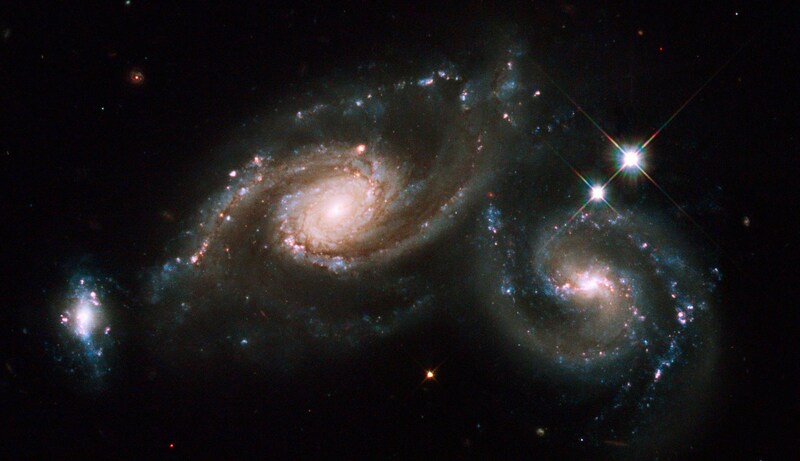 Galaxy collisions are a testament to the strange way in which space is scaled. The universe is a relatively crowded place on the galactic scale, which is why these collisions are fairly common. But when galaxies crash into each other, the stars in them are so far apart from each other that the stars themselves usually don’t collide. Think of it this way. If you were to draw a 1 cm dot that represented the Sun, the nearest star to the Sun (Alpha Centauri, ~4 light-years away) would be a slightly larger dot about 400 km away. That’s how much space there is between the stars. Now, if you were to draw a 1 cm dot that represented the Milky Way Galaxy, the nearest galaxy to ours (Andromeda, ~2.5 million light-years away) would only be 25 cm away. 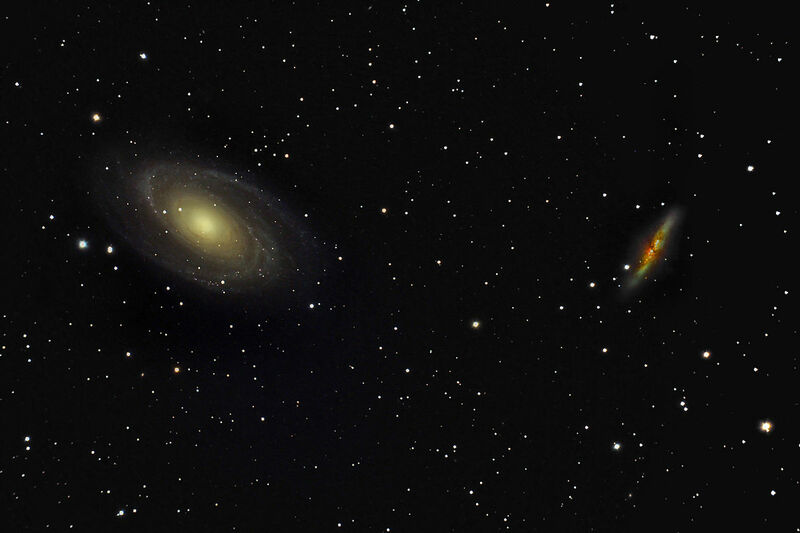 That’s why galaxies often collide, but stars usually don’t. 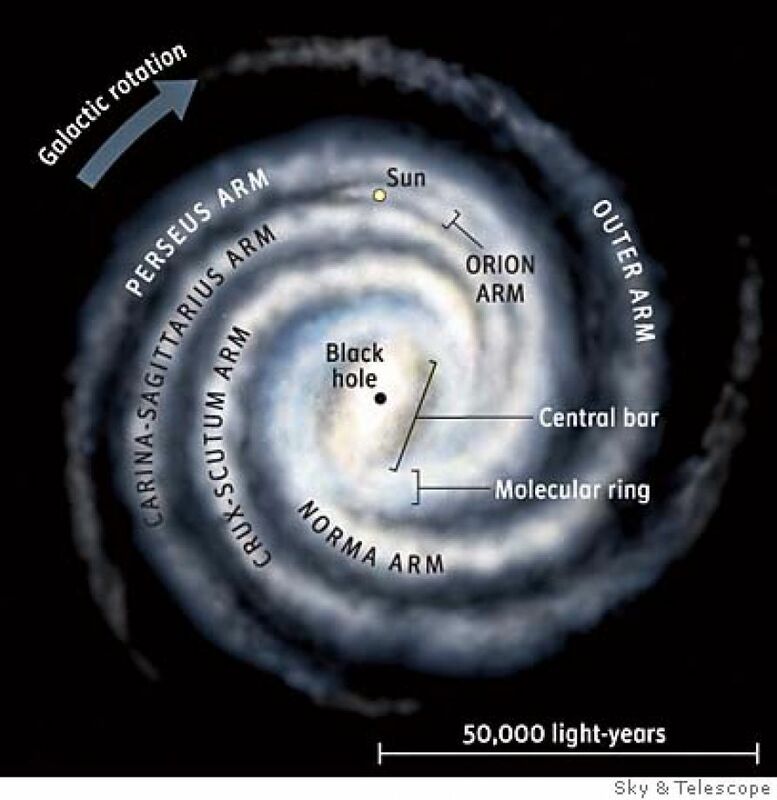 However, the gas and dust that is inside galaxies does collide, and this leads to a brief period of intense star formation as the galaxies gravitationally tear each other apart. Once this violent dance settles down, a newly formed galaxy remains. Galaxy collisions take hundreds of millions of years to play out, so what we’re seeing with images like the one above are cosmic snapshots of collisions. Astrophysicists use supercomputer simulations to hugely speed up the process and explore what a full collision would look like. 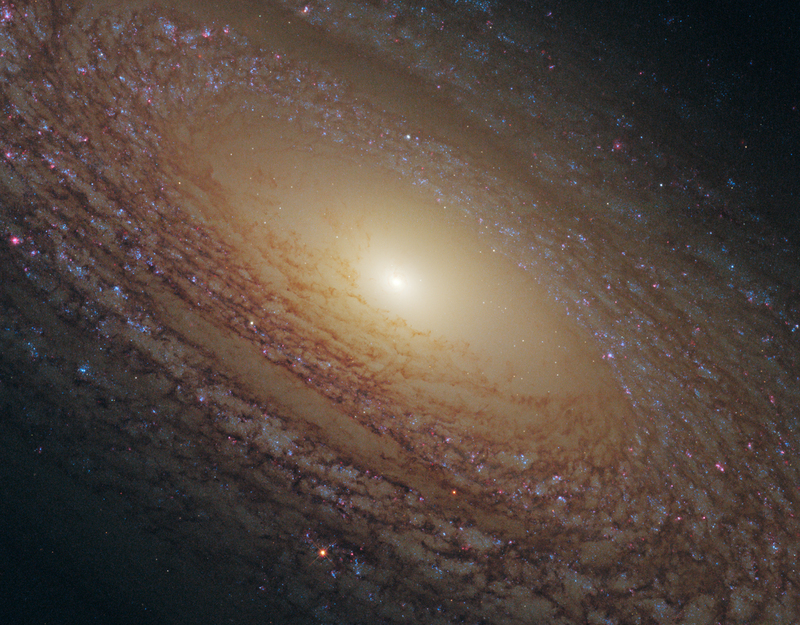 Image credit: NASA, ESA, M. Livio (STScI) and the Hubble Heritage Team (STScI/AURA). Here is your weekly reminder of Psalm 19 — Saturn’s moon, Enceladus. Enceladus is the sixth-largest of Saturn’s 62 moons. At 500 km diameter, it is dwarfed by Saturn’s largest moon, Titan (5,100 km) and Earth’s Moon (3,500 km). It was discovered in the late 18th century by the German-English astronomer, William Herschel, whose son, John, named it. 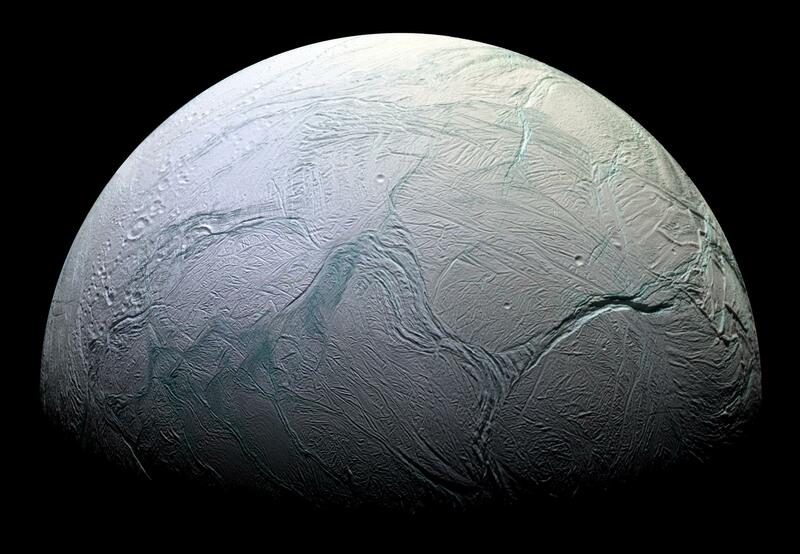 Not much was known about Enceladus until the Voyager missions studied the moon in the 1980s. The Cassini mission followed in 2005 to study Saturn and its moons in greater detail. The above image was taken during this latest mission. The surface of Enceladus is comprised of clean ice (as opposed to “dirty” ice, which contains rock, dust, and organic compounds) that reflects most of the sunlight that reaches it. Enceladus has an active surface, with over 100 geysers spewing water vapor into the rings of Saturn. Last year, Cassini found evidence of a subsurface ocean beneath the icy surface. The Cassini spacecraft is scheduled to fly through one of Enceladus’ geyser plumes in the hope that it will reveal the chemical makeup of its liquid ocean. Here is your weekly reminder of Psalm 19 — star forming region, LH 95. 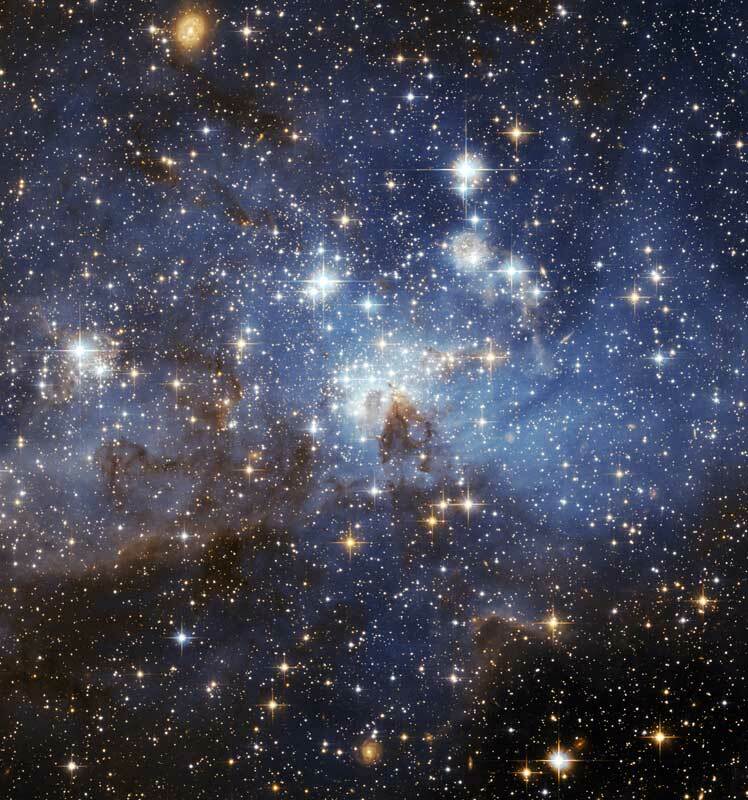 LH 95 is a stellar nursery, a region in which star formation is actively occurring, in the Large Magellanic Cloud (LMC). The LMC is a small, irregular satellite galaxy orbiting the Milky Way, but visible only from the Southern Hemisphere. LMC’s close proximity allows detailed views of stars and nebulae in a galaxy outside of our own. Astronomers have identified thousands of baby stars in their initial stages of development in this nursery, providing a detailed picture of how star formation in the early Milky Way likely occurred. The blue color in LH 95 is starlight from very large, hot stars reflecting off hydrogen gas. 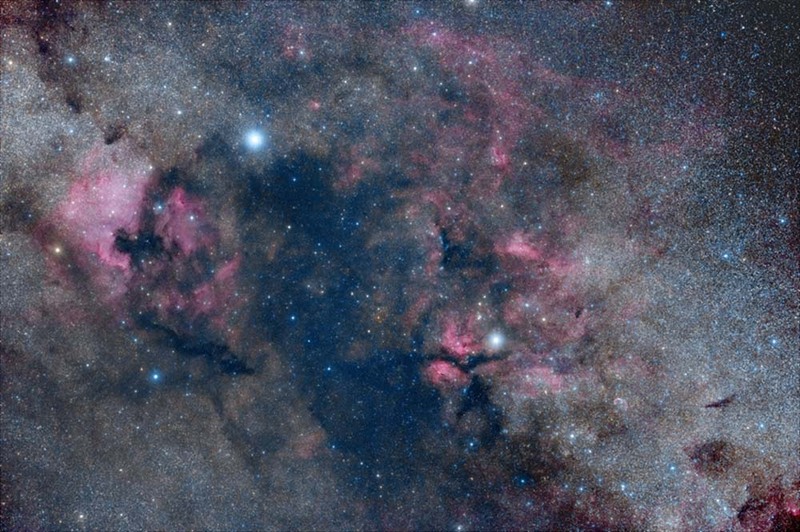 This glowing gas is surrounded by the cold, dusty molecular gas out of which new stars form. 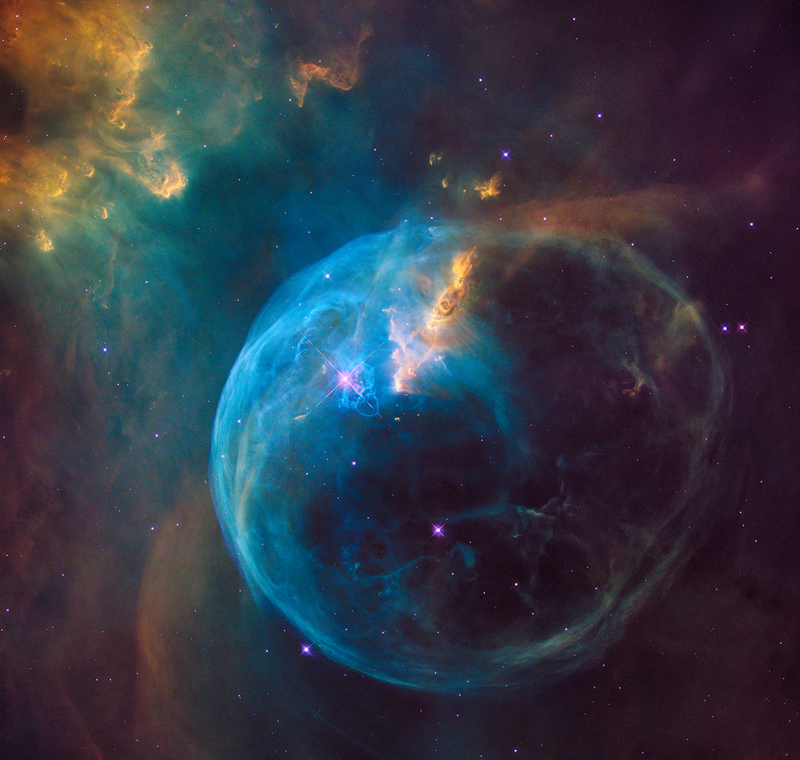 Image credit: NASA, ESA, and the Hubble Heritage Team (STScI/AURA)-ESA/Hubble Collaboration. Here is your weekly reminder of Psalm 19 — a “supermoon” lunar eclipse. Last Sunday, many of us were treated to a rare combination of a lunar eclipse and a “supermoon.” A supermoon occurs when a full moon phase coincides with the Moon being at its closest point in its slightly elliptical orbit around the Earth, making our lunar companion look slightly larger (~14% in diameter) in the sky than normal. What really makes a supermoon “super” is its increased brightness — owing to its closeness to the Earth, a supermoon is 30% brighter than a regular full moon. A lunar eclipse occurs when the Earth moves between the Sun and the Moon, blocking out the sunlight that normally reflects off of a full moon. When I teach introductory astronomy, the students who are really paying attention will ask why we don’t always get a lunar eclipse during a full moon phase. 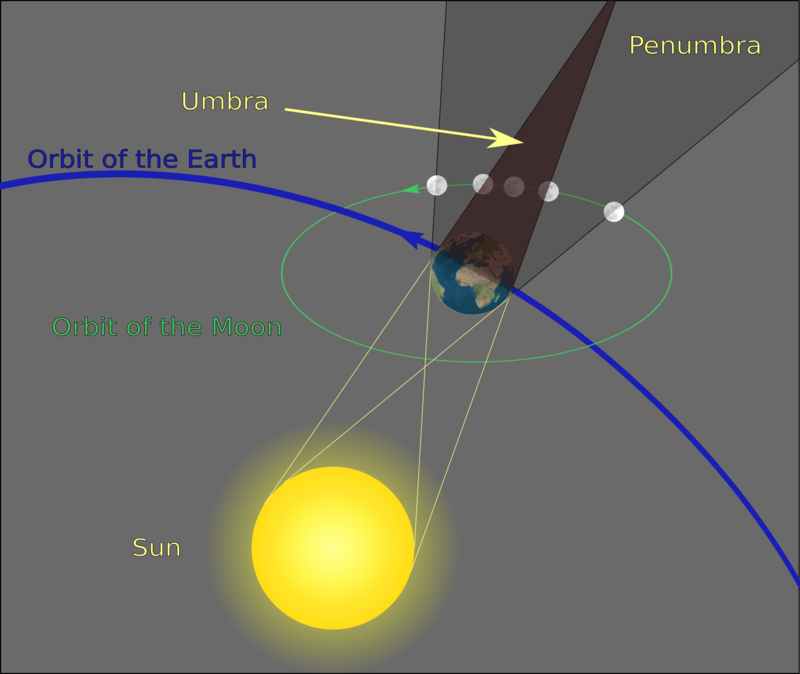 The answer is, the plane of the Moon’s orbit (outlined with the green circle above) is slightly tilted with respect to the Earth’s orbital plane (outlined in blue), so that most of the time the Earth does not block light coming from the Sun. Rarely, we’ll get the Sun, the Earth, and the Moon lining up when the Moon is in the Earth’s orbital plane, and that’s when we experience a lunar eclipse. The next time a supermoon will coincide with a lunar eclipse is in the year 2033. 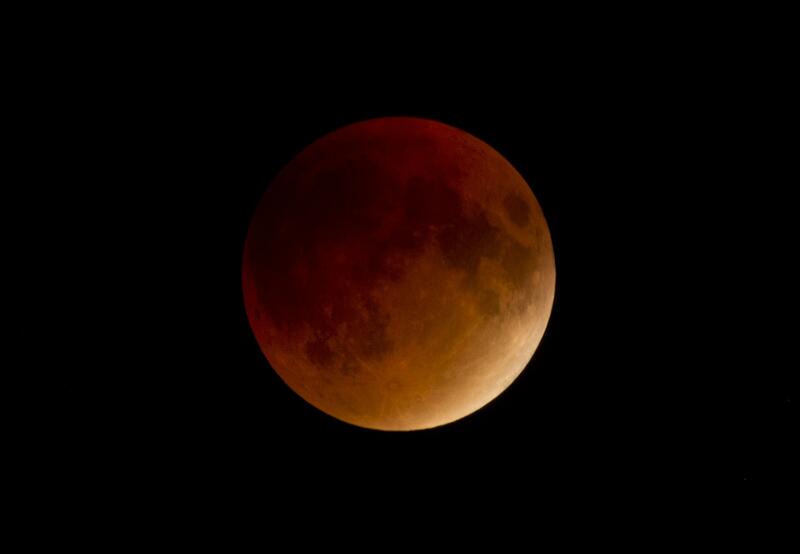 Supermoon lunar eclipse photo credit: Dina Rudick (Boston Globe). Lunar eclipse schematic credit: Wikipedia.